One nice Lionfish shot with a Bandito Three Prong Paralyzer. The best on the market hands down. 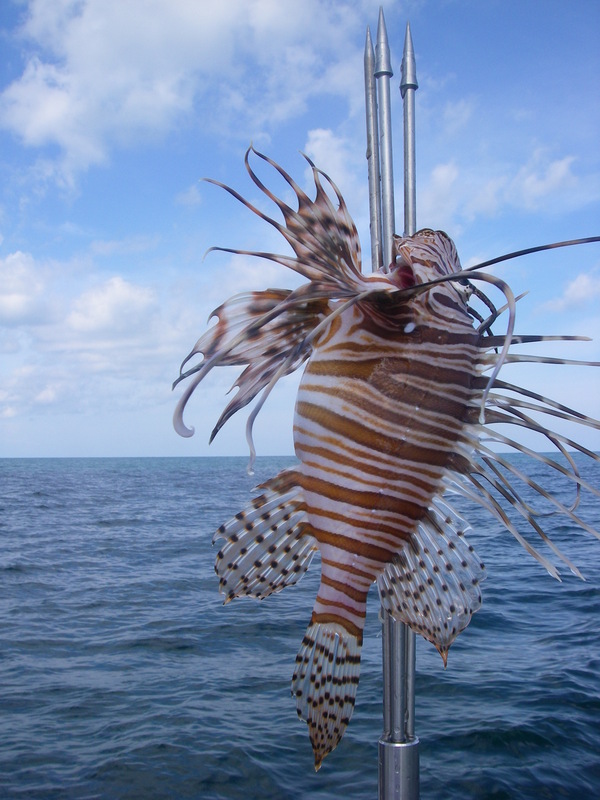 Lionfish have invaded the Eastern United States and Caribbean!!!! Check out all the Bandito Lionfish gear. Bandito Lionfish nets, Bandito Lionfish polespears, Bandito Lionfish spearguns, and Bandito Lionfish holding bags will help you catch these invasive creatures with ease. 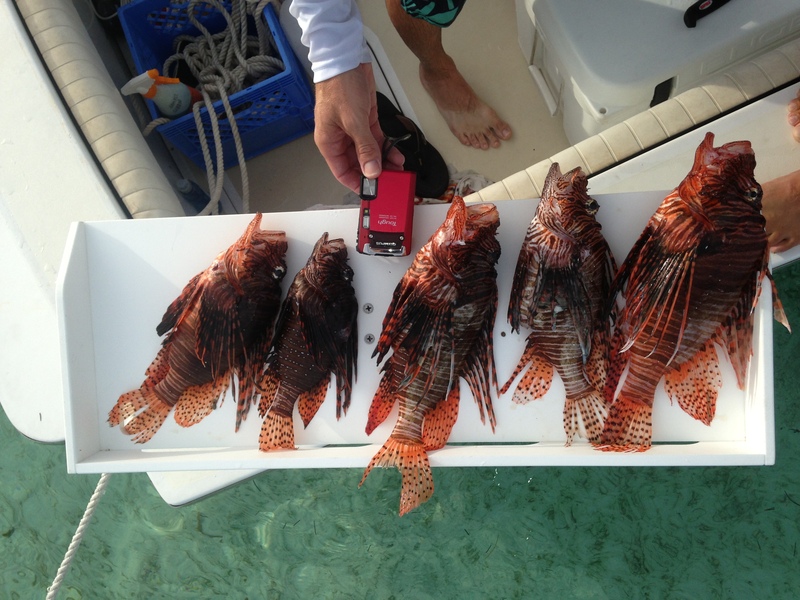 Lionfish are a great fish to catch and eat. We just read on myfwc.com that a Florida recreational fishing license is not required for recreational fishers targeting lionfish while using a pole spear, a Hawaiian Sling, a handheld net or any spearing device that is specifically designed and marketed exclusively for lionfish. 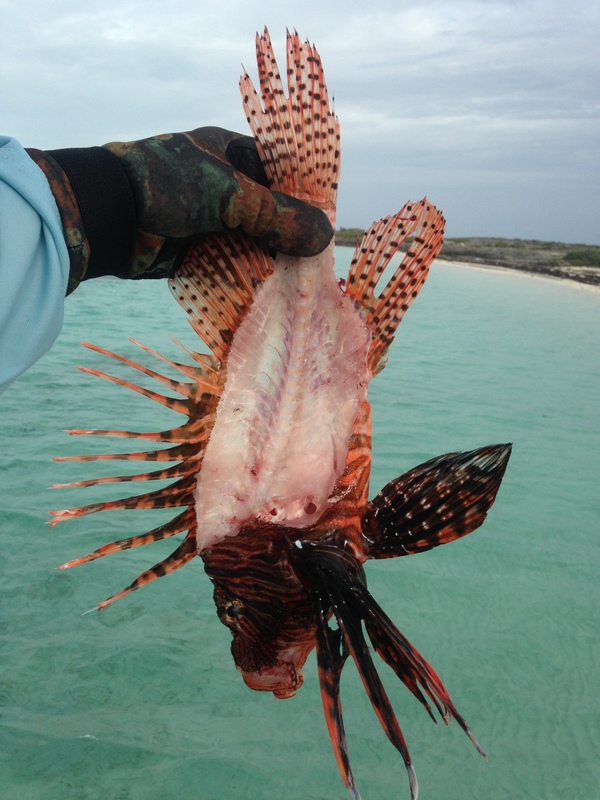 There is no recreational or commercial harvest bag limit for lionfish. 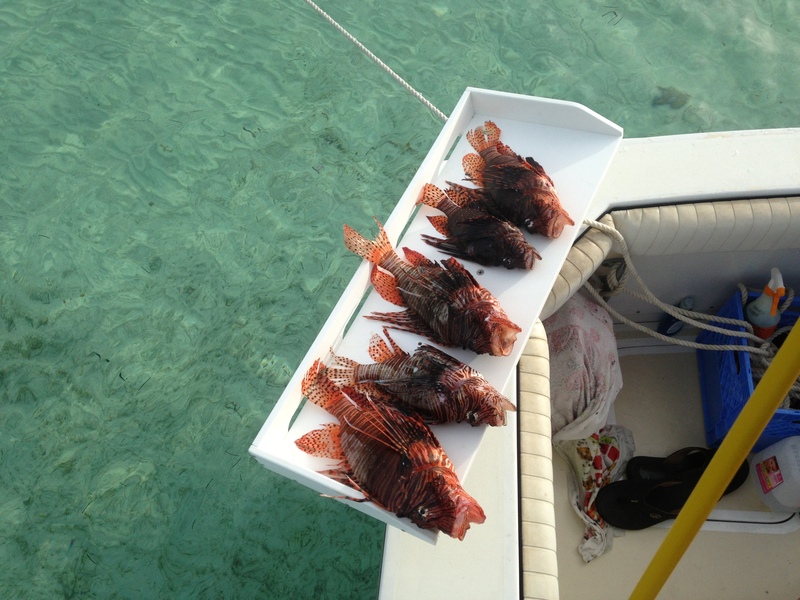 Learn more about harvesting lionfish. Cleaning Lionfish is easy as pie. Some people cut off the sharp spines before cleaning the lionfish but that is not necessary if you are not worried about getting poked. If the fish has been dead for more than an hour there is not much toxin left so if you do get poked, it does not hurt much unless you get the spine jammed really far into you and it breaks off. Don’t bother skinning the fish, simply blow the super small scales off the Lionfish with the water hose then filet the fish like normal. You can also gut the fish and fry it whole. The meat is super white, mild, and is a little less firm than the Hogfish you catch and eat in The Florida Keys. 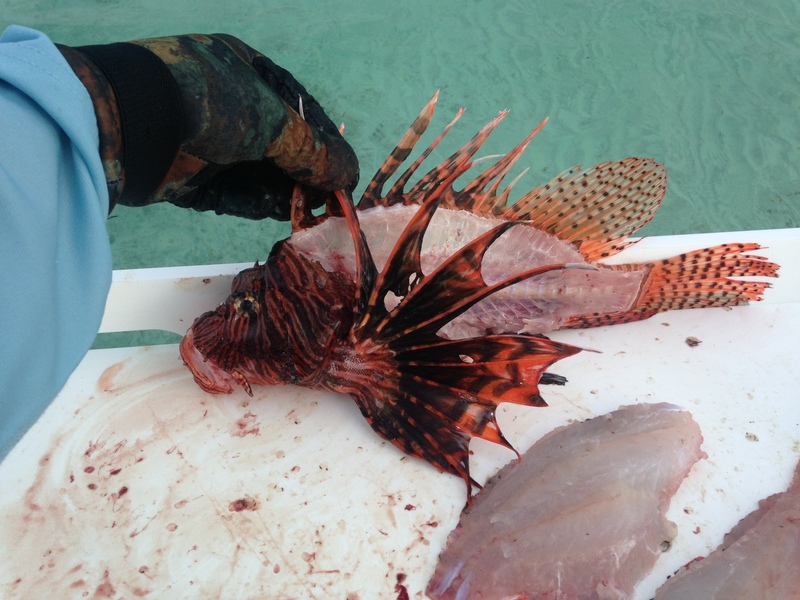 Not much meat left on this Lionfish! The nice meat on Lionfish makes great Ceviche too. These guys clean up pretty good for dinner. A normal camera next to the Lionfish for size comparison. 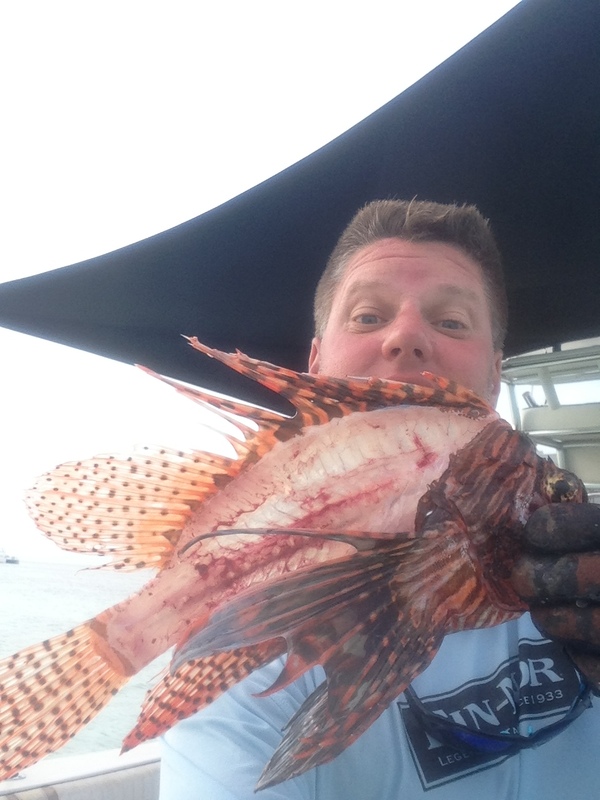 A real nice catch of Florida Keys Lionfish.